Home Blockchain Will blockchain revolutionize the way we vote? While cryptocurrency was created to engender specifically economic freedom for individuals, but a number of developers are looking to blockchain as a potential technology for securing political liberty as well, and for increasing voting convenience and security while potentially improving on democratic structures themselves. Recently, South Korea has begun trialing blockchain voting, the latest in a number of jurisdictions who are looking for blockchain as a potential way to introduce a 21st century voting process securely and transparently. Earlier this year, Japan Times reported that Japanese city Tsukuba introduced blockchain powered voting for proposals on ‘social contribution’ projects, while CNN reported that West Virginia introduced blockchain voting for overseas troops. Digital voting is attractive as an alternative to traditional voting because it foregoes the need for manual voting, the need for objective oversight, and the infrastructure required to create polling stations and processes. 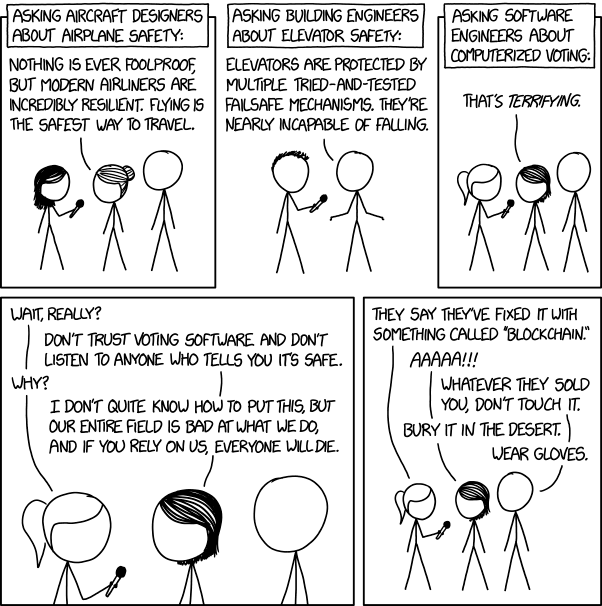 Still, digitizing voting comes with its own set of perils, introducing the possibility of hackers, machine error, and confusing user interface. In theory, blockchain could fix these problems in turn, by introducing transparency and self-authenticating, indelible voting ledgers. According to He3 Labs’ blog, the startup together with Universal Tribal Partners are trialing a blockchain overhaul of the Native American Crow tribe’s government infrastructure. The effort strives to put citizenship, voting, and land registry on a blockchain, coupled with cryptocurrency payments. Disregarding the Orwellian implications of putting each citizen on an self-securing algorithm based on their biometrics, the effort will offer a trial run for blockchain’s use in the public sector. The Crow nation, like many Native American tribes often suffers from economic and legislative insecurity in relation to the United States. Hopefully, blockchain technology really will enhance the Crow nation’s sovereignty and control over their economy. The most revolutionary suggestions for blockchain-based democracy has perhaps been ‘Liquid Democracy,’ which is not only an implementation of blockchain based voting, but a completely new voting system which combines the benefits of direct democracy with the convenience of representative. Any democracy exists on a spectrum from direct democracy, where everyone is able to vote on every policy change, to representative democracy, where voters vote on representatives who decide the policies on their behalf. While in an idealized democracy, perhaps everyone would be able to vote on the minutiae of every single government decision, it is simply not expedient or practical, so democracies must abstract their citizen’s votes to delegates. The liquid democracy project, which is also called delegative democracy, sees blockchain as a way to get around this. In a delegative democracy, everyone would have the capacity to vote on every decision or optionally give that vote to a delegate of their choosing. This way, if someone had a vested opinion on a minute detail of a decision they could always vote on it, but for most things one would give their vote to a delegate who they trusted to make those decisions for them. This would ideally combine what is beneficial about direct democracy and what is expedient about representational democracy. While blockchain is perhaps not yet mature enough to guarantee secure voting records, and while it certainly doesn’t have the public confidence to underpin an e-voting revolution, blockchain voting has its utopic proponents, and blockchain’s future in the public sector remains to be seen.